Granville Villa is far more than a basic assisted living facility, says Executive Director Collette Mieres. The La Vista senior living community was designed to cultivate a dynamic environment that enriches the lives of its residents, whose needs range from occasional assistance to hospice care. “Our mission is to provide a lifestyle that fosters independence, actively engages the mind, invigorates the body and nurtures the spirit while offering residents and their loved ones the peace of mind they deserve,” Mieres says. That means trained professional staff is available 24 hours a day, Mieres explains. With a goal of encouraging the greatest degree of autonomy possible and creating a guide for staff to provide the most appropriate daily living support, a highly individualized plan is developed with the resident before move-in. The plan includes input from his or her physician and even the family, if desired, and contains elements such as medication reminders and administration, shower assistance, dressing assistance, and more as needed. Palliative and hospice care is available through outside agencies. Granville Villa opened in 2000 and underwent renovation in 2010; its contemporary design is enhanced by warm and inviting décor. The 40-unit, one-story community features large, open, accessible and comfortable spaces for activity and relaxation. Services and amenities include an exercise room, a library, a nail spa and aromatherapy room, and even a beauty salon and barbershop. Activities go beyond merely keeping seniors safe and supporting their health needs, too: residents enjoy board games, movies, cards, dominoes, and similar social activities, plus have access to fun classes from Wii Sports to social technology basics. A wide array of fitness classes is also available. Life at Granville Villa is full of extras. The dining program features fresh, home-cooked meals. Residents enjoy laundry service full-service housekeeping. Plus, friends and family are welcome visitors and can even enjoy mealtime together in a private dining room. 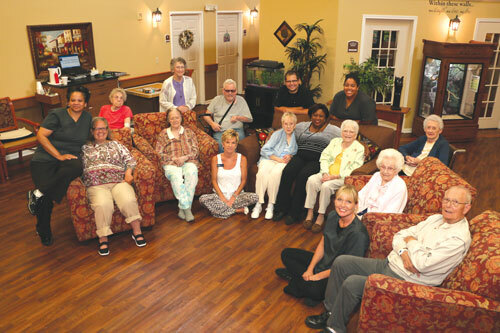 Throughout the year, Granville Villa hosts holiday gatherings that residents can celebrate with their families, and staff members regularly drive groups to local markets, restaurants and attractions. In addition, “We care about not only the physical and emotional well-being of our residents, but their financial health as well,” Mieres says. She explains that while it’s common practice for assisted living communities to require new residents to put down large, non-refundable payments up-front, Granville Villa offers a simple lease for its units, which range from studios to two- bedroom floor plans. “We offer our residents all the perks of country club living without the expensive buy-in,” she says.